Many companies depend upon accurate weighing results. This is why we never fail to keep up with the latest trends in technology. Digital platform scales are among the most versatile weighing products available. These scales are the most modern weighing devices ever created, and ours never stop evolving. Many of these come with highly sophisticated features. Digital platform scales play a crucial role in many industries. They have helped many businesses grow and improve product accuracy. However, if these devices do not come from a reliable manufacturer like us, they become a liability rather than an asset. If owners do not choose these devices carefully, they end up paying more for repairs or buying a replacement unit. Digital platform scales are industrial scales that are designed to determine the weight of any object placed on top of them quickly and accurately. While balances are used for weighing smaller objects, digital platform scales can weigh much larger objects. 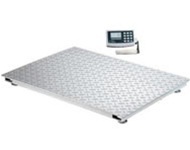 Digital floor scales have the capacity to weigh objects up to 20,000 pounds. The mechanical versions of these scales have mechanical or dial beams. Their mechanical components include bearings and pivots on the sides of the scale and a sliding or spring dial. They can resolve weight increases of half a pound for every 1000 pounds of capacity. Among the major drawbacks of analog platform scales are the moving parts they contain. They are prone to wear and tear caused by friction. In addition, shock loading on the scale can cause changes in the form or shape of bearing surfaces. The biggest problem with mechanical scales is that they are difficult to read. Users often end up with inaccurate readings because it is more difficult to read a spring dial than a digital display. Because of these mechanical problems, manufacturers gradually turned to electronic scales. Many manufacturers have tried various options to eliminate all these problems and come up with a durable, accurate and reliable product. They removed all the mechanical lever systems. They placed a large beam type load cell in the center of the platform. This was successful in eliminating the mechanical problems. Fortunately, we have found the best solution for this. Our platform scales feature a unique design that is engineered to provide the most accurate readings while removing the mechanical problems. These scales use four specialized load cells rather than a single large load cell. One of these cells is positioned in every corner of the platform scale. The cells do not have to exert too much effort to resist side loads. Using stainless steel to make the load cells makes these scales even more durable. This feature makes our platform scales more resistant to overloads and shock. To boost efficiency, we match the load cell outputs up carefully. This will ensure that users obtain only the most precise readings, regardless of the size of the load placed onto the platform. Trimmer resistors and summation boards are used to match the outputs. The load cells can also be pre-matched so that there will be no need to connect more parts. This helps stop digital platform scales from being damaged. These features are available with our Series 3200 Platform Scales. They come with platforms that range from 20 by 27 to 27 by 60 and even 48×48. Capacities range from 500 up to 1000 pounds. Custom orders are also available if customers need larger platforms. All of these only come from our experts. Platform scales can be used in many applications. Laboratories, manufacturing companies and industrial facilities use platform scales every day. Buyers should consult with our team of experts in choosing the most suitable digital platform scale. Companies should only buy platforms that match their weighing needs. The price of the equipment depends on the material and size of the platform. They should bear in mind that the objects to be weighed should never hang over the edges of the platform. The center of gravity should remain at the center of the platform itself. This will ensure that objects are weighed correctly. Buyers should establish the resolution parameters and the weight capacity that they need. These two factors greatly affect the price of the device. Before purchasing a scale, consumers should specify the maximum weight of the objects that they are planning to weigh and the resolution they require. Buyers should also consider protection against dirt and moisture. The units should be resistant to water splashes so that they are safe to use in all types of working environments. Buyers may ask for the calibration certificate. Annual recalibration may be necessary. More information about calibration is available in scale manuals. Buyers should check to see if the scale would give both standard and metric readings. Some models may not provide the necessary units of measurement. The display should also be easy to position. This allows operators to quickly and conveniently read the results. The scale should also offer a rechargeable battery pack option. Although it can be attached directly to the main power source, battery operation is an excellent back-up. This is helpful, especially if the equipment will be used in areas that are far away from power outlets. For advanced applications, the device should be compatible with printers, PCs or other equipment. These features help operators do their job quickly. It also allows them to store important information gathered from the weighing device directly to the computer. This gives them easy access to the data. The display should be big enough to be read even from a distance. It should also have large digits. The device should be user-friendly. Although all digital platform scales are designed for easy use, some models can be confusing. These models are often those attached to other electronic equipment like computers or printers. Digital platform scales often come with many functions. User-friendly scales come with complete instructions. Basic functions should be easy to understand even without the help of the seller or the manufacturer. In order to make use of all the functions that come with the scale, buyers should check to make sure that the manuals and guides are written clearly. Digital platform scales are very versatile tools. They can make a lot of jobs easier and more convenient. We can provide quality digital platform scales to suit any application. Our professionals can design and customize appropriate platforms to suit the items that customers need to weigh. All models are guaranteed to be durable, and they can withstand a large amount of pressure. We design our digital platform scales to be free from typical mechanical troubles. Our experts have changed the way that platform scales are used. Owners and operators can be very confident when using our digital platform scales. They no longer have to worry about potential mechanical repairs that were a problem in the past. Whether buyers want a device that can connect to computers and other technology or just a standalone platform scale, we can handle it. The best thing about choosing one of our digital platform scales is that every design is based on extensive research and advanced engineering methodology. We can use stainless steel for almost all of its weighing platforms to increase durability. This is why we can be used in many applications that range from the simplest weighing needs to the most daunting tasks. Our digital platform scales make it easy for customers to narrow down their choices. We have experts ready to help buyers choose the most applicable equipment for their business. Our team is ready to answer questions and help buyers pick out the best weighing device. We can also help businesses in the manufacturing, technological and agricultural industries design specialized scales to suit their specific weighing needs. Contact us contact us today so we can get started on fulfilling your scale needs.